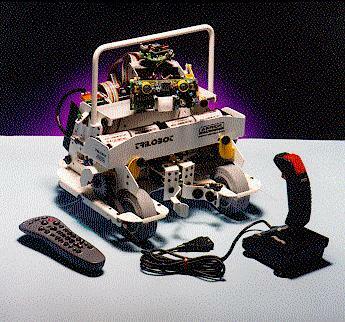 The above picture shows the Trilobot Mobile Robot from Arrick Robotics, advertised to be intended for AI research and education, so I chose him to represent this assignment. He can move around his environment and pick up things, and he uses informed search, as opposed to a blind search. This homework assignment is to program an A* heuristic search (graph search) to allow an agent to compute the shortest path from a start point to a goal point that goes around obstacles. The scenario of this problem is that the agent is located at point A and he needs to get to point C. He can move to any of a finite set of points in his environment. However, there are also a set of obstacles, so he cannot move directly from A to C, but must instead avoid the obstacles. The points in the space have real coordinates (x,y) and are just the vertices of the obstacles. To make the problem a little computationally simpler, we will limit the obstacles to be rectangles. The agent wants to plan a path from A to C that does not cut across any of the obstacles. A move must be from some vertex I to another vertex J (the robot will never be at a point other than a vertex, unless it is moving from one vertext to another). I and J may be on the same rectangle or on two different ones. He is allowed to move along an edge of an obstacle, just not through it. The possible operators at each state are just the moves to any of the other states. Many of them will be illegal, because the line from the current state to the other state intersects a rectangle. Therefore, you will need to code a utility function that determines if a given line segment intersects a given rectangle. The heuristic function h should use the straight line distance from the current vertex to the goal vertex, which can never overestimate the true distance. Your program (which must be in Python 2.7) should read the input data from a file. The format of the file is as follows. The first line contains 2 (real) numbers separated by spaces. These are the X and Y coordinates of the start state. The second line contains 2 (real) numbers separated by spaces. This is the goal state. The third line contains 1 (integer) number. This is the number of obstacles. Each of the remaining lines gives the position of an obstacle. The line contains 8 numbers, representing the X and Y coordinates of each corner of the obstacle (which is rectangular) in clockwise order. Two samples are provided - A simple dataset (annotated with comments, picture), and a more difficult one (annotated with comments, picture). First try the very simple one and then the more difficult one plus at least one test data set that you design with at least 5 obstacles (be creative). Program source code, with comments for each routine (as described in HW1) and listing showing the input to and output from each of the three data sets (my 2 and yours). Also turn in a picture that illustrates your own customized dataset (similar to the two picture examples we gave) Turn-in format is a zip file. 20 points total, 10 for a working program, 2 for solution to the simple data set, 4 for solution to the difficult data set, 2 for solution to your data set, 2 for code and comments. LATE POLICY: Programs may be turned in until Tuesday night, January 29 at 11:59pm. 10% off for each day late. CHEATING POLICY: All work on this assignment must be your own. You may discuss the assignment with other members of the class, but your code should not look like anyone else's code in this class or prior classes or on the web. Having the same code with different names for the variables doesn't work either. We check. Thanks.